As we welcome in a New Year, let’s explore the astronomical wonders that we can see from the Western Slope during 2018. From tonight through March, the stars of winter will shine brightly in our evening skies. It’s worth it to brave the cold night air, if only briefly, to view the spectacular constellations of Orion, Taurus, Gemini, and Auriga, and the sky’s brightest star, Sirius. If skies are clear before dawn on January 31, we’ll get to see a total lunar eclipse. The Moon will first enter Earth’s dark, umbral shadow at 4:48 a.m. MST. The eclipse will become total about an hour later at 5:52 a.m. The Moon will take on a dusky, reddish color, just before morning twilight starts brightening our sky. As temperatures warm in April, the planet, Venus will become noticeable in the west during evening twilight. And, by mid July Venus will be a brilliant beacon in a dark western sky and remain dazzling in the early evening throughout the summer. But Venus will not be the only planet that draws our attention. Jupiter, Saturn, and Mars will also be easy to spot in the summer of 2018. Saturn, with its magnificent ring system, will be a treat to view, even through a small telescope. 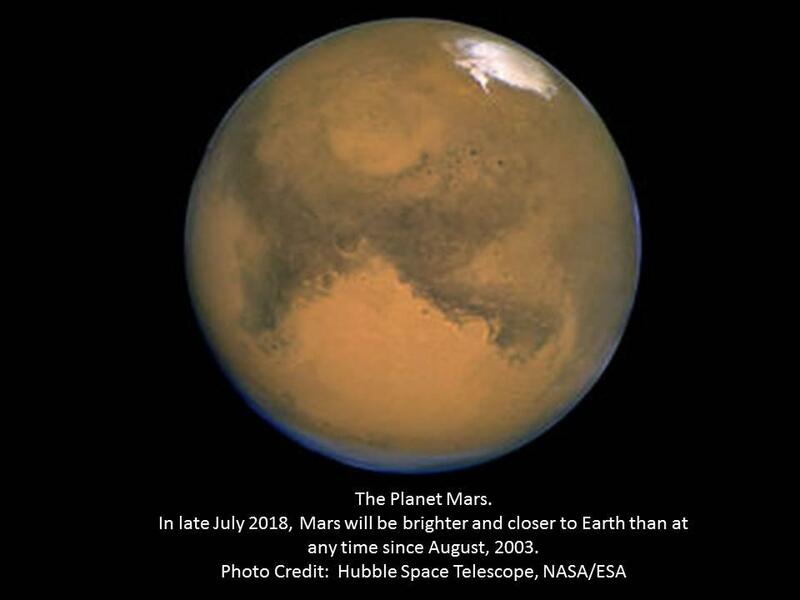 In late July, Mars, the red planet, will be closer to Earth and brighter than at any time since August, 2003. And, while you’re enjoying some warm, moonless, summer nights, be sure to take in the impressive star clouds of our home galaxy, the Milky Way. The latter part of 2018 will feature 3 prominent meteor showers with little or no interference from moonlight. These are the Perseid Shower, which will be best during the early morning hours of August 12 and 13, the Leonid Shower during early morning hours of November 17 and 18, and the Geminid Shower on the night of December 13 to 14. So, do enjoy these astronomical wonders during 2018! Western Slope Skies is produced by the Black Canyon Astronomical Society. This episode was written and recorded by Art Trevena.